Air Canada Vacations has dropped the price of a last minute charter flight to San Juan, Puerto Rico (SJU) down to $189 CAD roundtrip including taxes. - With just one date combination at this price, this appears to have sold out quickly. The price is now returning at $1000+. These are available again, as of 11:26 AM EST on Nov 16. Dec 13 to Dec 20 has now dropped to $189 CAD roundtrip including taxes. It's likely to sell out fast, as other date combinations have. Dec 06 to Dec 13 has dropped to $189 CAD roundtrip including taxes. toronto, yyz, caribbean, eastern caribbean, flight deals, air canada, san juan, puerto rico, sju and greater antilles. 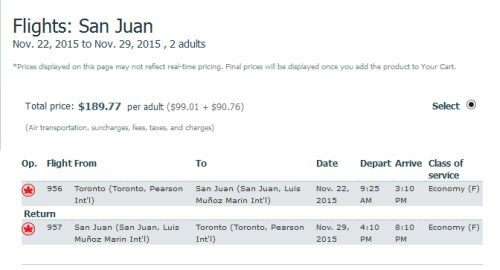 One Response to "Last minute: Toronto to San Juan, Puerto Rico - $189 CAD roundtrip including taxes"